SOUTH Asians have had a simple answer to Cinderella's fairy godmother for a long time now, and this is the sari. It is amazing how a simple piece of cloth measuring roughly 12 yards in length and requiring no form of stitching can transform a woman into a symbol of femininity and grace. Saris have been the attire of choice for our women folk since ages ago, and are still reigning today for their ability to bring out the best in a Bengali woman. These magic outfits come in a wide range of fabrics and designs. Isn't it hard to imagine a fabric making a mighty Empire quake in its boots? Well, that was the case with muslin saris during the Mughal era. This fabric, which appeared sometime around 500 AD, reaching the peak of its popularity sometime between the 15th and 16th centuries, gets its name from Mosul, a place in Iraq where it was traded with Europeans. 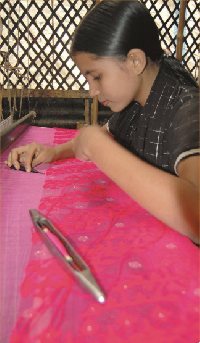 The places near Dhaka such as Rupganj, Kapasia, Sonargaon, Junglebari etc were well known for weaving high quality muslin. It is created from the corpus cotton grown in Kapasia. The thread was so delicate and soft that it had to be worked on in the early hours of the dew laden morning. That way the moisture would keep the thread pliable lest the heat and dryness of the afternoon caused it to snap. In fact Dhaka was the source for some of the finest muslin pieces. The best muslin saris are such that an entire outfit can be folded and tucked into a matchbox. As a result it has taken pride of place as Dhakai Muslin in the Victoria Albert Museum in England. In Dhaka the industry reached its height of glory during the Mughal era. The royal women folk preferred to swathe themselves in the luxuriously soft material. Nur Jahan and Mamtaz Mahal took full advantage in aiding their beauty. When the English took over the Subcontinent, they found this beautiful material to be a threat to their own textile industries, which were far inferior in quality, so it was off with the fingers for the weavers, and thus the industry met a sad end. The present day muslin saris are a bit different in the sense that these made with a different thread and in a different weaving process. This work in mainly carried on at the Mirpur Benarasi Ward. The outfits are gorgeous with heavy work, which determines the price. Mainly these are worn during festivities and special occasions like weddings. Historians cannot exactly determine when jamdani came about but it is well known that the descendants of the muslin weavers kept this trade alive. Jamdani also needs climatic conditions for proper development. It also requires a humid environment and that is why many weavers set up their business alongside riverbanks. Its creation is different from other fabrics in the sense that it does not use needles or the jacquard process. The craftsmen use tiny wooden or bamboo spikes to draw the intricate designs that consist of geometrical shapes. It is unthinkable for a Bengali woman not to have a jamdani sari in her wardrobe. It is a classical piece that makes any woman stand out in a crowd. Amazing designs can be found at Aarong, Mayasir, Nipun, Kumudinin, Prabartana etc. Then there's the Hawkers Market, Mouchaak and New Market. Of course, if you want alternative styles just head off straight to Demra or Rupganj. In a country where jamdani and silk is only for the rich but not necessarily famous, hand woven saris are the choice apparel for those on a budget. It has been in use during the English rule when all else was considered a threat to the English cloth industry. For both the weavers and the common people this type of sari became their preferred material. Taat or handloom materials have a rather heavy texture. These came in solid colours or in simple designs known as Dhakai Biti and Pabna Biti. Check and stripes were the prevalent patterns in a market that was starting to become crowded with Indian and Pakistani brands. For many years the women of this country were inclined towards buying the foreign goods. During the eighties this trend began to reverse with the help of some creative industrialists with new techniques in weaving, design and bold new colour combinations. In many cases golden and silver highlights are woven into the material to add a glitzy touch. At present such saris are exported and a lot of this credit goes to Monira Imdad who started the Tangail Sari Kutir in Baily Road about two decades ago. The saris can be found at most of the shops in the city while a visit to Babur Haat in Narsinghdi will take you directly to the heart of the operation. A sari is a simple piece of cloth but the variations are countless in the ways it can be worn or in its design and material construction. Benarasi sari came about from the weavers of a locality by the same name in India. They would create exquisitely detailed saris interwoven with real gold or silver thread. Not surprisingly these would weigh a lot -- around 10-15 kgs. It is a booming business in Mirpur where there are several thousand artisans. It is a large area comprising of Mirpur roads 10, 11 and 12. New technology has allowed fibres like rayon or synthetics to add texture and reduce weight of the gorgeously designed katan and benarasi. 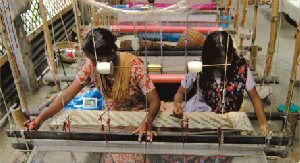 Power looms have made it a faster production process bringing the pricey items within reach of the common people. Prices can range from 2000 to 50000 taka. It's a special sari that people use on special days. It's akin to a dream outfit interspersed with the dreams and hopes of the weaver with that of the wearer. People used to go to India to shop for their wedding saris. While some still do the tides are starting to change. Many now come over from abroad to sample our offerings. The simple sari had its classical beginnings from the muslin trough the humble handloom products till the present day glamour pieces. It's style and elegance in a simple package. WHEN we were merely girls of seven or eight, my cousin Sonia and I used to love to imitate our mothers in our games; their friendship, their love for life, their laughter, their loving tantrums with our fathers, but mostly their elegance and the stylish art of wearing saris. We were so fond of this impersonation that we literally played wearing saris that were hung on the clothes line in the huge open veranda at our grandmother's house. It was a real comical scene. Half of the six yards of cloth was stuck on the line by a wooden peg, while we pulled on the flowing half to create makeshift aanchals, all the time standing under the sun, we two played 'bhabis'. Oh, we also plaited the dupattas hanging around the line and wore them on our heads to emulate braids. So much was our love for saris and playing adults. I guess all little girls of Bengali mothers go through this phase at least once, because interestingly my eight year old is demanding me to add few more to her already existing sari wardrobe. I think this fascinating piece of cloth has this hypnotising effect on all of us sub-continental girls. I remember this Jamdani walla who used to visit our mothers with beautiful saris stacked in his canvas bag. What a festivity it would be when he displayed each one with pride while the ladies went crazy picking the ones they liked. The sari has often been described as 'the apparel that covers all...yet reveals all'. What is it about this length of cloth wrapped around a woman's body that adds so much allure? Visitors from distant kingdoms and empires to this part of the globe since time immemorial have been tantalised by bewitching women clad in saris. Legend has it that when the beauteous Draupadi, wife of the Pandavas, was lost to the enemy clan in a gambling duel, the Lord Krishna promised to protect her virtue. The lecherous victors, intent on "bagging" their prize, caught one end of the diaphanous material that draped her so demurely, yet seductively. They continued to pull and unravel, but could reach no end. Virtue triumphed yet again in this 5,000-year-old Indian epic, the Mahabharat. Legend, fantasy, history or fact, it is the first recorded reference to the enduringly attractive sari - the longest, most popular style in the history of women's fashion. The traditional six-yard sari, however, is a classic and allows for generous pleating and draping around the body and over the shoulder - almost Grecian in its elegance. 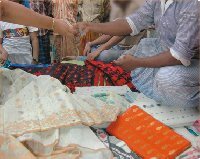 The basic draping of a sari, the folding, tucking and pleating, beyond that, the sari is a Bengali woman's statement to the world. It could be of shimmering silk or the finest gauzy cotton. Perhaps a pastel-hued solid colour or a riot of woven flowers. It may even be embroidered with golden threads, or finished with a richly tasselled border. It speaks of romance or riches, of sobriety or gaiety, of sophistication or innocence. Men are intrigued by the demure floor-length attire and tantalising display of a bare midriff in the back. It is said that a sari rarely fails to flatter a woman, making her feel fragile and feminine. It is an instant fashion, created by the hands of the wearer and subject to none of the vagaries and changes that plague the fashions of the western world. The success of the sari through all the centuries is attributed to its total simplicity and practical comfort, combined with the sense of luxury a woman experiences. "The sari, it is said, was born on the loom of a fanciful weaver. He dreamt of woman. The shimmer of her tears. The cascade of her tumbling hair. The colours of her many moods. The softness of her touch. All these he wove together. He couldn't stop. He wove for many yards. And when he was done, the story goes, he sat back and smiled and smiled and smiled," narrates an ardent fan of the apparel. Actually like mentioned earlier the women love to wear saris because they saw their mothers, grandmothers wearing it. It is this urge to replicate that elegance for which women throughout the ages are passionate about this apparel and this opinion was very enthusiastically seconded by a lovely lady-Sadya Afreen Mallick. "I love to wear saris, it always makes me feel like dressing up, a bangle or a bead necklace maybe, it always makes me feel and look graceful. Remember our mothers used to wear glass nylon saris and had lovely machine or hand embroidered petticoats with them? Often the petticoat was more fancy then the sari itself, some even had cut work or chikan material bordered by intricate laces. I mean those were style statements made by the wearers themselves. They were their own designers," she recollects. Young girls today opt for shalwar kameez or jeans simply because they feel they don't have the time to dress. After all they do lead high pace life today than they used to in yesteryears. What they're missing out on, is the unbeatable impression created by a cotton sari starched in aap (a silver shimmer used when starching or washing a sari, a fashion quite lost today), with beli phool in the braid. It's sheer enchantment, one that even the most 'modern' madam isn't immune to. So why fight the inevitable? Here's to losing oneself in the sensuous sorcery of the sari.